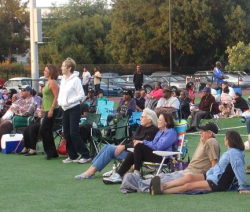 Enjoy a free summer concert in Menlo Park featuring a variety of musical styles from jazz to country to hits of today and yesterday, from 6:30-8 pm on Wednesdays from June to August in Fremont Park (University and Santa Cruz Avenues). Bring your picnic blanket and dinner, and of course there is always room up front for dancers of all ages. No concert on Wednesday, July 4, 2018. Dance band Ballroom Blitz is a high energy Rock and Roll band with an authentic rock edge that has been entertaining Northern California audiences since 2012. They get audiences up on their feet and dancing with an extensive playlist and a non-stop show of crowd pleasing classics covering the 80’s through today’s pop; such as favorite rock grooves like Styx, Foreigner, Heart, and Donna Summer to Blondie, Maroon 5, and Keith Urban.